Newly renovated mid-Cape cottage by the warm water beaches of Nantucket Sound! 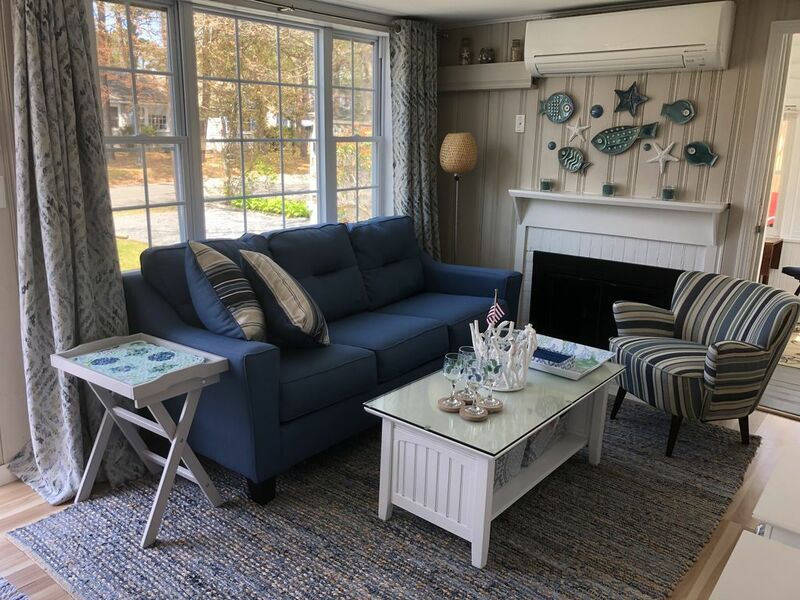 This is a classic and charming 2 bedroom Cape Cod cottage located mid-Cape, in the highly desirable South Yarmouth area. It is the perfect location to enjoy all the Cape has to offer. Our cottage is super clean and has a full kitchen, dishwasher, washer/dryer, high speed internet/wifi/cable (Netflix too), parking for 2 cars, a private backyard and a large wrap around deck. We also have a grill, an outdoor shower and a fire pit. The neighborhood is quiet and about 1/3 of a mile from Nantucket Sound beaches (warmest waters on the Cape)! We are very close to many family centered activities, shopping areas, marinas, fishing, boat tours, restaurants, pubs, golf, entertainment and ferry ports but tucked away in a residential area. This is a great year round home for vacationing, a business trip or for a romantic weekend get away! This location provides you with easy access to all the Cape has to offer, no matter the season. The cottage is also minutes to the Martha's Vineyard and Nantucket ferries. This is a quiet, private space for you and your party to enjoy. We would love for you to enjoy your precious free time at our "home away from home". This is a whole property rental. No owner or other guests reside on the property to interrupt your stay. There is a lockbox on the property and we will send you the access code a few days before you arrive. We will leave you alone unless you have a question for us. On occasion someone may come to mow the lawn or pick up the trash from the backyard but we will let you know in advance. We’ve vacationed on the Cape every summer since childhood and highly recommend a cottage over the majority of other options on the Cape. It's far more private, comfortable, peaceful and enjoyable. We just purchased this cottage in January 2018 but you can check out the reviews from the guest of the previous owners (Dave and Tiz) if you look up Rental 712969. So far this year we have re-sided the cottage, repaired the fences and deck, built a new outdoor shower enclosure and replaced the majority of the furniture and furnishings inside. Our home is located in South Yarmouth, Massachusetts, United States. We are in a quiet neighborhood of cottages by the beaches on the south coast of the Cape, yet close to everything you will need. There are many amenities close by so anything you need or desire is conveniently within reach, and typically within walking distance. While you can walk to many places keep in mind our spring/summer can be very hot and winter can be pretty cold. You could also experience a tropical ten minute downpour during the summer months. For those reasons we recommend a vehicle or bicycles (lots of rental places close by). There is also in town bus service available. Hyannis is only a few miles away. We only ask that our guests take care of and respect our property and leave it in the same condition it was in when they arrived. Quiet hours are after 10PM EST. The cottage is not equipped with infant security latches. Hi there, Our names are Sean and Jenn. We are a professional couple with a beautiful daughter. We love the cape, traveling to places tourists normally don't go, SCUBA diving and reading on the beach. Jenn grew up vacationing with her family every summer and owning a cape cottage was on her bucket list. We are the new and proud owners of the Squeeze Inn, a place wee been renting for several years now. We´ve tried all the hotels on Cape Cod at one point or another and nothing beats having your own cottage. This area of the Cape is my favorite. It is great to be able to have a cottage with a fenced in backyard, outdoor shower, grill and firepit. You can rinse all the sand off after a long day of fun and sun and still really enjoy being outside. Being from Massachusetts it is key for us to maximize our time outdoors when the weather is fair. In the years we have stayed in the cottage we have rarely showered or cooked indoors and it is heaven! Pillows, sheets, blankets and comforters. Fully stocked with the basics. Includes a dishwasher and microwave. Quaint, cute place. Decorated to perfection! We found it a bit cramped for 4 girls... ideally it would be great for a family of 4. But we had a wonderful time! We had a great stay in this special cottage. The beach décor was awesome and the kitchen was perfect. Beautiful big backyard with plenty of chairs and a firepit. Bed was very comfortable! Loved walking to the ocean and so nice having grocery stores nearby. Great home base for exploring ! The ferry to Martha's Vineyard was so close and Provincetown is a must see! Thank you Sean and Jenn for letting us stay in your place... We loved it!! Thanks so much for staying with us and for the great review. We are glad you enjoyed your trip! Come back anytime. Clean, updated house with a spacious yard for dogs. Enjoyed every minute. Everthing was clean and cared for. Location was quiet good for dogs and small kids with a fenced in yard. Thanks so much for staying with us and glad you had a great time. We look forward to you returning in the future!